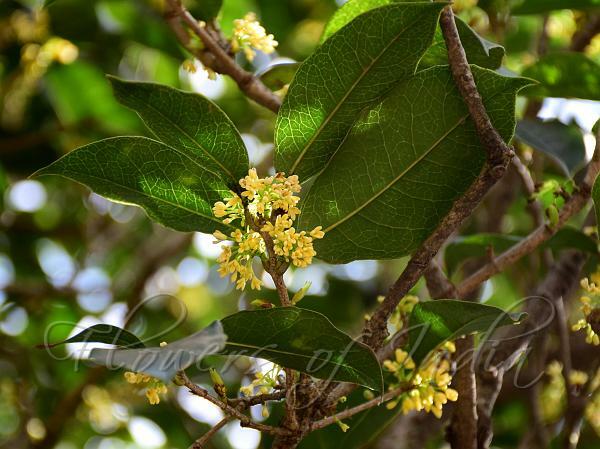 Fragrant Olive is an evergreen shrub or small tree growing up to 3-12 m tall. The leaves are 7-15 cm long and 2.6-5 cm broad, with an entire or finely toothed margin. The flowers are white, pale yellow, yellow, or orange-yellow, small (1 cm long), with a four-lobed corolla 5 mm diameter, and have a strong fragrance; they are produced in small clusters in the late summer and autumn. The fruit is a purple-black drupe 1.0-1.5 cm long containing a single hard-shelled seed; it is mature in the spring about six months after flowering. It is cultivated as an ornamental plant in gardens in Asia, Europe, North America, and elsewhere in the world for its deliciously fragrant flowers which carry the scent of ripe peaches or apricots. In Chinese cuisine, its flowers may be infused with green or black tea leaves to create a scented tea. 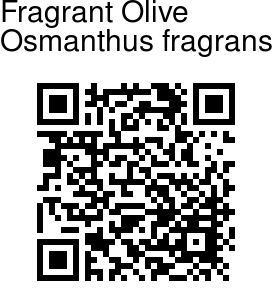 Fragrant Olive is found in temperate Himalaya, at altitudes of 1200-3000 m, from Garhwhal to Sikkim, China, Japan. Flowering: September-October. Medicinal uses: In traditional Chinese medicine, osmanthus tea has been used as an herbal tea for the treatment of irregular menstruation. The extract of dried flowers showed neuroprotective, free-radical scavenging, antioxidative effects in in vitro assays. It is also used in Ayurveda. Identification credit: Amber Srivastava Photographed in Dehradun, Uttarakhand.